The UK’s approach to Brexit negotiations will come in for criticism in the European Parliament later. MEPs will vote on a motion saying the UK’s approach to financial issues has “seriously impeded” progress. It also says a decision on whether to move negotiations on to their next phase should be delayed unless there is a “big breakthrough”. The UK said the motion was drafted before the most recent round of negotiations. 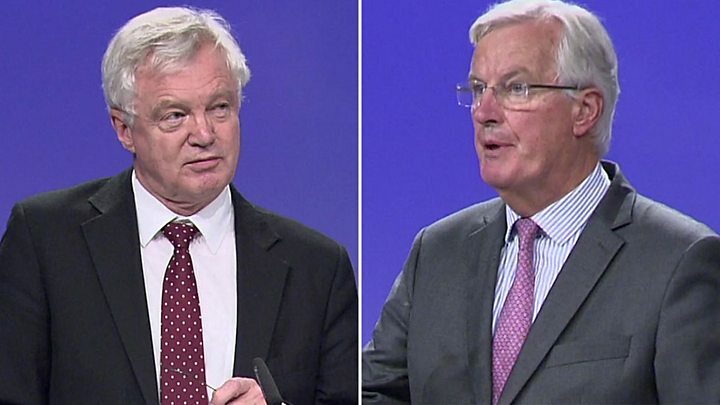 The Department for Exiting the EU said that since then “the dynamic of the negotiations has shifted and we have instilled real momentum into the talks”. It comes with the UK keen to start talking about what kind of trading relationship it will have with the EU after Brexit. The original aim had been to get the go-ahead for these discussions when EU leaders meet next month. But the EU says this can only happen when the European Council decides there has been “sufficient progress” on three issues: the so-called divorce bill when the UK leaves, the rights for EU citizens in the UK and UK citizens in the EU and the Northern Ireland border. The motion – which has been proposed by the main political groupings so is likely to be passed – says Theresa May offered “some clarifications” on these issues in her speech in Florence last month. It also says during the transition period she proposed, EU law would have to continue to apply in full under the jurisdiction of the European Court of Justice, and there could be no limits on the free movement of citizens. The motion calls for “reciprocity, equity, symmetry and non-discrimination”, also applying to future family members born after the UK leaves the EU. 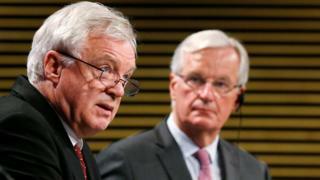 It also criticises the UK’s proposals so far – involving EU citizens applying for a new “settled status” after five years – and says people are suffering “unnecessary hardship and anxiety”. And on another sticking point, the amount of money the UK will pay as it leaves the EU, it says: “The absence of any clear proposals has seriously impeded the negotiations”, adding that “substantial progress in that area is required before entering into discussions on other issues”. A Department for Exiting the EU spokesman said: “We recognise and respect the vital role the European Parliament will play in this process and that this resolution sets out its views. However, it will be for the council to decide on sufficient progress.